Recent Additions to the Kress Collection, National Gallery of Art, Washington, D.C., 1946, no. 725. Frankfurter, Alfred M. "Luini Frescos That Bring the Renaissance to Life." Art News34, no. 12 (21 December 1940):8, repro. Cairns, Huntington, and John Walker, eds. Masterpieces of Painting from the National Gallery of Art. New York, 1944: 52, color repro., as The Illusion of Cephalus. Frankfurter, Alfred M. The Kress Collection in the National Gallery. New York, 1944: 43, repro., as The Illusion of Cephalus. Paintings and Sculpture from the Kress Collection. National Gallery of Art, Washington, 1945 (reprinted 1947, 1949): 109, repro., as The Illusion of Cephalus. Paintings and Sculpture from the Samuel H. Kress Collection. National Gallery of Art, Washington, 1959: 181, repro., as The Illusion of Cephalus. Summary Catalogue of European Paintings and Sculpture. National Gallery of Art, Washington, 1965: 79, as The Illusion of Cephalus. Cairns, Huntington, and John Walker, eds. A Pageant of Painting from the National Gallery of Art. 2 vols. New York, 1966: 1:142, color repro., as The Illusion of Cephalus. European Paintings and Sculpture, Illustrations. National Gallery of Art, Washington, 1968: 69, repro., as The Illusion of Cephalus. Shapley, Fern Rusk. Paintings from the Samuel H. Kress Collection: Italian Schools, XV-XVI Century. London, 1968: 141-142, fig. 345. European Paintings: An Illustrated Summary Catalogue. National Gallery of Art, Washington, 1975: 204, repro., as The Illusion of Cephalus. Shapley, Fern Rusk. Catalogue of the Italian Paintings. 2 vols. National Gallery of Art, Washington, 1979: I:285-288, II:pl. 202. Walker, John. National Gallery of Art, Washington. Rev. ed. New York, 1984: 195, no. 228, color repro., as Illusion of Cephalus. European Paintings: An Illustrated Catalogue. 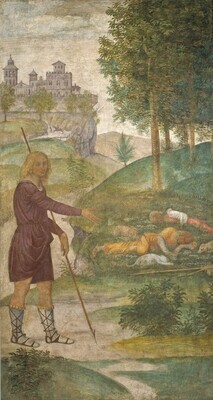 National Gallery of Art, Washington, 1985: 238, repro., as The Illusion of Cephalus.